In this Thursday, Nov. 30, 2017, file photo, general maintenance technician Paul Bourque, of Everett, Massachusetts, rolls a wheel wth a new tire toward a vehicle at a Goodyear Auto Service Center, in Stoneham, Massachusetts. Goodyear is now under investigation for defective motor home tires that may have caused a number of deaths and injuries. 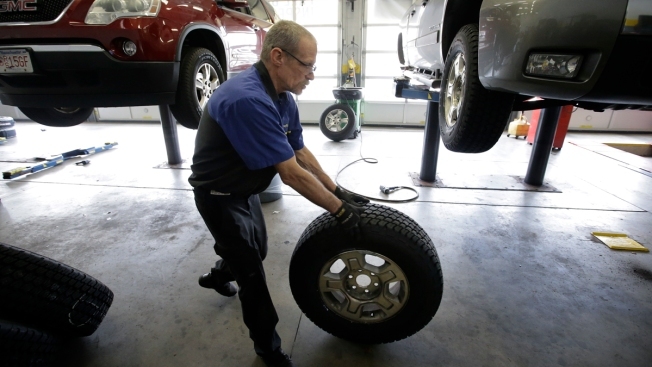 Within a decade, defective tires may be the cause 95 injuries or deaths. The U.S. government's road safety agency says it has received allegations that defective Goodyear motor home tires caused crashes that killed or injured 95 people over a decade. The allegations were revealed in an information-seeking letter sent to Goodyear by the National Highway Traffic Safety Administration. Last year, the agency began investigating whether Goodyear's G159 tires are unsafe. The probe began after a judge ordered the release of Goodyear data that had been sealed under court orders and settlement agreements. Lawsuits and safety advocates allege the tires were designed for delivery trucks and not for recreational vehicles that travel at highway speeds. Goodyear says it received the letter and will provide the requested information on the tires. The investigation covers about 40,000 tires made from 1996 to 2003.